Not the exactly the news fans craving for more Robotech wanted to hear, but truth is truth and we're in the need to know so here it is. Harmony Gold will postpone the next Robotech animated feature Shadow Chronicles: Shadow Rising until further development on the Robotech Live Action Film. Apparently Warner Brothers has enough pull to shoot down Tommy Yune's statement on the Space Station Liberty podcast about the Robotech Live-Action Movie not having an effect on continuing production of the animated series. This stems from Xenophon's post on the Official Robotech Forums we discussed in our previous article. For now the fact is that Shadow Chronicles: Shadow Rising has been postponed until the Robotech Live-Action Movie gets in gear to Warner Brother's satisfaction. On the brighter side, a possible animation series might come out of the RLAM just like the Transformers did and hopefully HG is pulling resources to work closely on the RLAM. According to Xenophon over at the Official Robotech Forums. Kevin McKeever stated at A-Kon in Dallas that "absolutely nothing has happened" with the movie other than WB and Tobey MacGuire's production company having acquired the rights. First off RELAX, before you shrug your shoulders in bitter disappointment and switch to flashbacks of nothingness of some 20 odd years, just bear with us a moment as we dissect this with caution. TSC Collector's Edition DVD Debuts in China! Guangdong Qianhe Audio & Video is pleased to debut the new Collector's Edition of Robotech: The Shadow Chronicles to fans at the 4th annual China International Cartoon and Animation Festival. This special 2-disc set, supervised by Guangdong Qianhe Audio & Video, features the award winning film with digital audio in both Chinese (2.0) and English (5.1) with over 140 minutes of bonus content, including new Chinese material exclusive to region 6! Read more: TSC Collector's Edition DVD Debuts in China! Have you ever wondered what a VF-1 would look likr if it was made out of LEGOS? Well look no further than the image to your left. That's right, FoundryDX specializes in LEGO-based Robotech models instructions. Of course, the instructions are available for a price. LOS ANGELES, California - Toynami announced that they will begin distributing classic 1/55-scale VF-1 transformable toys based on the original Japanese molds designed by Takatoku. These toys are highly coveted among casual fans and dedicated collectors alike for their sturdiness and rarity. and now Toynami will be bringing them around the world at affordable prices. The VF-1 is also widely recognized by Transformers collectors as the underlying form of the original G1 Jetfire toy. This release will mark the first time that these toys will be offered officially outside of Japan under both the Robotech and Macross brands. Toynami will begin this summer with anniversary editions of 1/55 VF-1S and VF-1J variants and continue this fall with armored VF-1A Super Valkyries as seen in Macross: Do You Remember Love. 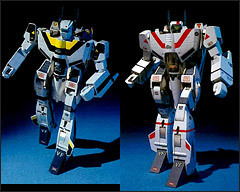 2009 will mark the release of 1/55 Veritechs from the Robotech television series, with plans to eventually release all known 1/55 Valkyrie toys, including rare and exotic variants.